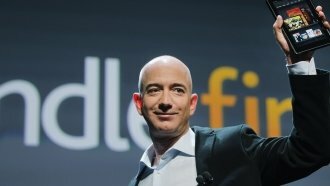 TheDream.US says Jeff Bezos' $33 million donation is the largest in the organization's history. Amazon CEO Jeff Bezos and his wife just donated $33 million to a college scholarship fund for "dreamers." That name often describes undocumented immigrants brought to the U.S. as children. TheDream.US called the couple's donation the largest ever made in the organization's history. Their grant will fund 1,000 college scholarships for U.S. high school graduates enrolled in the Deferred Action for Childhood Arrivals program, known as DACA. The donation announcement comes the same week President Donald Trump met with lawmakers from both sides of the aisle to kick-start further immigration negotiations. As Newsy previously reported, Trump and lawmakers appear to have different ideas about what should go into a bill to revive the program, which is set to be repealed in March. Trump rejected a tentative immigration deal from a bipartisan group of senators Thursday. TheDream.US launched in 2014. Since then, it's awarded more than $19 million in financial assistance to around 1,700 scholars.